This was my first experience with Kenneth Lonergan, as a director at least. I've heard a lot of my colleagues cite his 2011, and much beleaguered, film, Margaret, as one of the best efforts of the decade thus far. When you get that sort of effusive praise, it's hard not to get excited about what might around the corner. I went into Manchester by the Sea not knowing a whole lot except that it's very Bostonian and Casey Affleck is quite good in it. Both of these things are true, but the real takeaway is just how unrelentingly sad it all is. To be clear, if someone said: "make a proper approximation of grief for the moving picture" this would be a pretty solid contender for it. Even from its pitch: the ever morose-eyed Affleck plays an apartment handyman named Lee whose older brother passes away and leaves Lee as the sole guardian of his son, Patrick. Lee, a man struggling with a previously devastating loss - one that cuts even deeper than the death of a sibling - has become someone without real purpose. He just lives, but isn't alive. His first reaction to his brother's will is one of indignation and refusal, remembering the pain of something so emotionally destructive, a wound that can never really heal - can he take on this responsibility for the growing young man? Can he return to Manchester and face his ex-wife who still haunts the town like a spectre of the past? Can he overcome the scorn of those that remember what once was and how it all came crashing down? 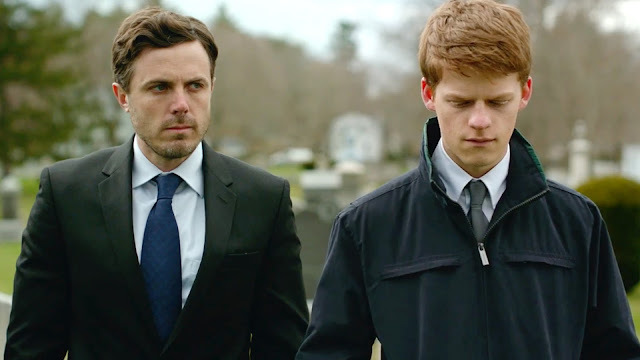 You'll note I used the words "grief", "devastating", "emotionally destructive", Manchester by the Sea is both in part a moving motion picture, but also litmus test in just how much an audience can surrender themselves to their worst possible emotional reflexes. When your film opens with the death of a loved one, or rather, the aftermath of it at the hospital, you get a sense of just how grueling an experience this is going to be. I'm loathe to make the comparison, but the opening act has a lot of echoes of Joss Whedon's "The Body" from Buffy the Vampire Slayer. I realize that sounds ridiculous, but it conjures up some of the same ugly material that resides in each of us in the face of sudden loss. From there, it's a film of small moments, with a focus on naturalism that will either fully invest you or may prove to be too much for some. Everything Lee does, be it try to convince Patrick to move to Boston with him, or help him reconnect with his mother, or get in a fight in a bar, or trying to make conversation with Patrick's girlfriend's mother. There's sense of shagginess throughout that aims to reflect the struggles of real life, especially that of someone in emotional recovery. This isn't the story of the revelational moment, there isn't a point to which Lee suddenly figures out that he can be human again, instead his life continues to creep along and he reacts to things as they come. Again, this will be tough for some viewers, with a narrative far slower moving than the average - shots linger galore, and its pulverization via sorrow perhaps begins to compact on itself. But what Lonergan is aiming for isn't just entertainment for entertainments sake, but instead the construction of a portrait that is all too human. The struggle of a man to face the day, even when the world is utterly suffocating him. Affleck gives perhaps the best performance of his career, striking a magical combination of the insular and the relatable. He's a wonder to behold, and this is his best work since The Assassination of Jesse James by the Coward Robert Ford. Lucas Hedges, the aforementioned Patrick, is startlingly good as a character that shares a few significant traits with Lee, particularly the emotional closeting that allows him to get through each 24 hours without breaking down in tears. Patrick is also one of the sources of black humor that pops up frequently, particularly in his sexual escapades. This is another element of loss that Lonergan gets, the occasional weirdly dark funny things that sometimes pop up in the face of it all. It's a strikingly beautiful film too, with wintry shots of New England providing the physical embodiment of the emotive climate of its protagonist, while also just being evocative for its own sake. And its narrative structure is pretty admirable as well, with sudden flashback cuts that fill in the gaps that we aren't privy to. They come and go, and discombobulate you at first, but in its way that too is a representation of mourning and the eventual restoration process. It's long, maybe too long for its own good with one , and Michelle Williams' performance never quite struck the right chord with me, but otherwise this is a film that lingers and has stuck with me in small part ever since I saw it. In the moment, it hit me like a ton of bricks. If you're prepared for it, you should see it.